Congratulations to the 2017 Mary Diaz Award Recipients! Jane and George have been called “the most active parent advocates in St. Paul Public Schools that I have ever seen”. As parents of Karen SLIFE students, Jane and George have been unyielding in their advocacy for the needs of SLIFE kids in St. Paul. George co-chairs the St. Paul KPAC (Karen Parent Advisory Council), a group that is actively advocating for Karen students in the school district by educating teachers and district administration about Karen culture, language, and educational needs. 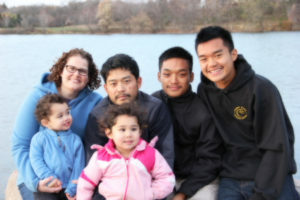 Jane is the sole parent on the MN Department of Education ELSIG (English Learner Stakeholder Input Group), where she provides parent perspective and continually gives voice to the needs of SLIFE kids. She attends countless district meetings, from School Board Public Comment, to School Board Member town halls, Parent Teacher Association meetings, English Learner’s Professional Issues Committee meetings, and many others, and is an outspoken voice demanding adequate EL resources and programming. Jane and George are on the forefront of the struggle to meet the educational needs of SLIFE students in St. Paul. They embody the vision and mission of MinneTESOL work, and they deserve our recognition and gratitude. MinneTESOL believes strongly in the importance of advocacy for immigrant and refugee English learners in Minnesota. We acknowledge that the jobs of ESL teachers go beyond the classroom and include many types of advocacy from connecting students to resources to lobbying legislators for policy changes. We have chosen to honor this important advocacy work by creating the Mary Diaz Award for ELL Advocacy beginning in 2017. Mary Diaz was “one of the founders of [Hamline University’s] ESL and bilingual programs. She also worked for the Comprehensive Assistance Center, housed in the Hamline School of Education, from which she provided technical assistance to school districts serving English learners to help them meet Civil Rights Act requirements. Several colleagues said she was better known for her work with refugee and immigrant education than anyone else in Minnesota” [Star Tribune].